Children’s ministry is set to make a big splash at this year’s Church of God Convention, and not just in the expansive swimming pools, water slides, and splash zone. Kid’s ministry programming has returned to the Convention, and it’s slated to be better-than-ever this summer at the World Center Marriott in Orlando, Florida, a city home to Walt Disney World and other attractions families will love. Warner Press and Church of God Ministries have partnered together to create KidzLIVE!, an original VBS-like experience in the mornings and structured childcare in the evenings. Pastors and laypersons with children will be excited—and perhaps relieved—to know their kids will have a place of their own while they take in all that Convention 2019 and General Assembly has to offer. “Big and Bold” is the theme of the morning VBS experience for children entering kindergarten through those who have just completed fourth grade. Each day, these children are invited to “join the circus” and discover the big and bold faith of classic Bible characters, including “David the Strong Man,” “Tangled Sisters Mary and Martha,” “Daniel the Lion-Tamer,” and “Jesus our Ringmaster.” Featuring fun games, creative crafts, a daily missionary visit, tasty snacks, and practical lessons, “Big and Bold” was conceived by Lori Bunyar, pastor of special events for Crossings Community Church in Oklahoma City. Working in tandem with Regina Jackson and Robin Fogle of Warner Press, and by recruiting the dynamic ministry team of Solid Rock Church of God in Kissimmee, Florida, Lori and Church of God Ministries have overseen the creation of a Convention experience that will leave not only adults refreshed and challenged, but kids, too. The first two Church of God Conventions held outside Anderson, Indiana, were at Crossings Community Church in Oklahoma City, beginning in 2014. Lori Bunyar’s work was instrumental in pulling the event off, so when the event moved to Wichita in 2017, she continued to walk alongside Church of God Ministries. When discussions began about bringing children’s ministry back to the Convention in 2019, Lori was an obvious go-to, not only with her extensive background in both events planning and children’s ministry, but also because she had written several original vacation Bible schools for Crossings Community Church. Donna Welch and Solid Rock Church of God team will staff and lead the evening childcare, also for kids entering kindergarten through those who have just completed fourth grade. Lori Bunyar will be bringing the technology from Crossings to the World Center Marriott to ensure safety through identification and correct parent-child matchups. Like the morning VBS experience, the evening childcare will offer kids the opportunity to stay active in a safe and caring environment, but with movies, time for free play, and conversation. To keep the experience alive far beyond Orlando, Warner Press will offer KidzLIVE! resources available at Convention 2019 for the local church to use. 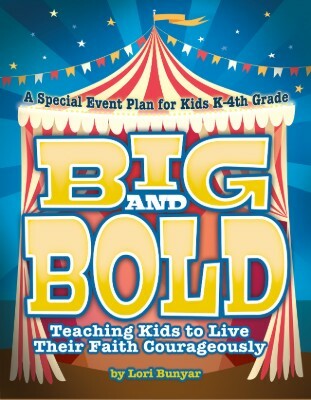 The Big and Bold curriculum book contains everything you need to know to create a fun, memorable, and educational ministry opportunity for kids. Advice and instruction are provided for decorations, snacks, and activities, along with complete lesson plans. These lessons will be spelled out step-by-step. Introductory games or activities, the main lesson, review questions, craft ideas, and snack ideas will be provided for each day. Remember, there is no Convention 2019 registration fee for children under eighteen, but they still must be registered. Pre-registration is required for the KidzLIVE! morning Big and Bold VBS at www.jesusisthesubject.org/kidzlive for a modest fee. Dropoff evening childcare is $10 per child, per night, but does not require pre-registration. This entry was posted in All Church of God, Church of God Convention and tagged Big & Bold, Big and Bold, child care, childcare, children, children's ministry, CHOG Convention 2019, Church of God Convention, Convention 2019 & General Assembly, Convention 2019 and General Assembly, Crossings Community Church, curriculum, Donna Welch, FL, Florida, kids, Kissimmee, Lori Bunyar, OKC, Oklahoma, Oklahoma City, Orlando, Regina Jackson, resources, Robin Fogle, Solid Rock Church of God, Vacation Bible School, VBS, Warner Press, World Center Marriott, WP. Bookmark the permalink.